This free-to-play 3D tactical war strategy multiplayer game is similar to Clash Royale except players collect units that they deploy in real-time on the battlefield. 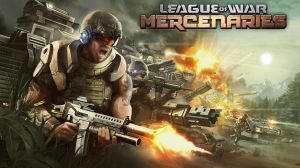 The object of League of War: Mercenaries is for players to build up their base and construct the necessary buildings to farm resources to strengthen their army with tanks, helicopters, infantries etc. and then send them off to battle other mercenary armies put together by the developers and other players. There are plenty of units to collect and they are divided into three types which are then split into colour coded specialities. Players who have played similar mobile strategy games before will find this game feels familiar as it borrows many elements from them.